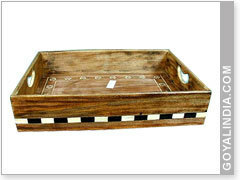 Item Size: H-3.25", L-16.25", W-11.25"
We are a top notch supplier of Bone Inlay Tray. We are successfully meeting the varied needs of our patrons by offering a wide gamut of Bone Inlay Tray as per their precise needs. Ø This Black, Bone Inlay Tray is simply stunning and perfect for serving food or drinks or as a beautiful decorative piece that could sit anywhere in your home. From our wide consignment, we are affianced in supplying wooden bone inlay tray. Being a noteworthy enterprise of this industry, we are offering a wide spectrum of Bone Inlay Shell Blue Coastal Mosaic Serving Tray. Wood Bone Tray available in various colours. Customer can ask to customise colour according to his preference. Being a leading firm in this industry, we are offering a high-quality range of Bone Inlay Serving Tray. 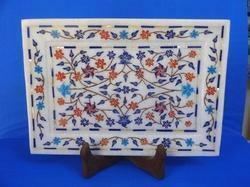 Banking on our enriched industry experience, we are able to supply Bone Inlay Tray. We are amongst the most reputed names in the industry, offering Bone Inlay Tray.